through a Jamaican village, straight into the hearts and souls of its vivacious characters. "Peedum" is a delightful collection of easy-to-read, hilarious stories and poems that skilfully engages all five senses by weaving together the aromas, sights, sounds and culture of a Jamaican village. Everything comes alive. From the clamour of revivalists to walking through the banana walk at night, to the sounds made by a kerosene lamp with a dying flame, every detail brings you closer to a true depiction of life as an innocent child growing up in rural Jamaica. Absolutely riveting stories of Jamaican life capturing the humour,simplicity and honesty particularly of country folk. A must read, especially for Jamaicans in the diaspora who tend to reminisce about life back home. The author masterly takes the reader through villages and towns highlighting the unique qualities of the culture and the people with short, compelling and enthralling narratives affecting the lives of everyday Jamaicans. Highly recommended. Whether you grew up in Jamaica or not, this heartwarming collection of stories and poems brings you ‘home’. At the heart of this collection is the innocence of childhood, with its wonders and woes; learning to ride, squabbling with siblings, coping with loss, and the ever-present fear of duppies. The poems woven throughout the book provide entertaining snapshots of Jamaican culture, managing to say so much in just a few lines. 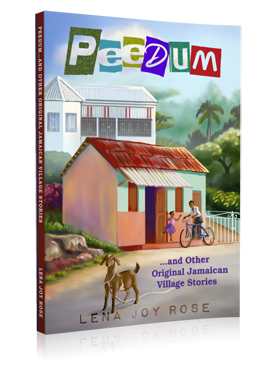 The author uses patois to hilarious effect, as she gently pokes fun at old-fashioned values, Overall, Peedum is a skillful tapestry of memories, traditions and Jamaican folklore that is deeply personal and yet universally appealing. Download a PDF copy to your computer right now! You will receive the full collection of stories in your email inbox shortly (you can save it and read it on your computer or print a hard copy).